With these criteria in mind, I’ve started posting roundups once a month on the theme of diversity. This is my second post highlighting picture books about the immigration experience. In Goldfish and Chrysanthemums by Andrea Cheng, a grandmother receives a letter from her brother back in China. He tells her that their father’s old house being torn down. At the house, there used to be a fish pond surrounded by big colorful flowers. Wanting to make her grandmother happy, Nancy buys two goldfish at a fair, digs a hole in the back yard for a pond, and asked her neighbor for some extra chrysanthemums. Nancy’s gesture not only brings comfort to her grandmother, but also deepens the bond between them. My least favorite part is the illustrations. The faces don’t seem the correct proportion. I also don’t know why the children have American names. My favorite part is the story of family, which shows how small acts of kindness can make a difference. According to publishers, Lee & Low, Cheng often writes about intergenerational relationships, and is based on her own experiences. Cheng was inspired to write Goldfish and Chrysanthemums after hearing her husband’s mother talk about her family’s garden in China. You can find a teaching guide at Lee & Low Books. In Nadia’s Hands, a Pakistani-American girl is offered the opportunity to be a flower girl at her aunt’s wedding. Her cousins caution her. There are many things to remember at a wedding: One needs to sprinkle flower petals down both sides of the aisle; One should avoid eating too much of the wedding food or otherwise one might get sick; One might get stage fright and not move. Nadia’s aunt reassures her that she’ll be a very good flower girl, and so Nadia feels relieved. Except then she finds out that another aunt would visit before the wedding to decorate Nadia’s hands with mehndi or paste that when it dries turns the hands orange or dark red. Nadia doesn’t want to go to school like that, and so her worries return. The rest of the story is the wedding ceremony and how Nadia came to terms with her fears. Nadia’s Hands is a sweet story about learning to take pride in one’s unique culture. A front page provides a glossary and a back page includes a thank you two Pakistan individuals for their help in the creation of the book. Karen English, the author of Nadia’s Hands, is a former school teacher and a Coretta Scott King Award-winner. Check out an interview with her at The Brown Bookshelf. In My Name is Bilal, two Muslim siblings start a new school. At their former home in Chicago, there had been lots of Muslims kids. Here, there seemed like there were none. Two boys tease Ayesha, pulling at her headscarf. Her brother tries to distance himself from his heritage, and in class he shortens his name from Bilal to Bill. A Muslim teacher offers a book to Bilal that is about the first person to give the Muslim call to prayer during the time of Prophet Mohammed. Through this book, Bilal discovers that others before him have needed to stand up for his faith. The next day he has that opportunity. Other surprises lie ahead too. This is my least favorite in this round-up due to its overt message, drab illustrations, and text level. The Lexile rating is 570 or about grade four, but this is a picture book, and most fourth-graders are reading chapter books. In addition, I was surprised that Bilah dressed in American attire, while his sister wore Muslim attire. Otherwise the book brought back memories for me of being inspired as a child by stories of Christian heroes and heroines. The author, Asma Mobin-Uddin, was born and raised in the United States but her family is from Pakistan. According to her website, she initially decided to write about the Muslim-American experience because she had difficulty finding books on the topic to read to her children. In I’m New Here, the stories of three children from other countries struggle to adjust to their new school in the United States. The children are from Somalia, Guatemala, and Korea. They struggle with speaking, reading, and writing in English. The words of their new language sound strange and look like scribbles and scratches. They also struggle with making friends. The people and places around them used to be familiar; now they can’t find their place. The rest of the story tells how the three children came to call America home. My favorite part is the bright illustrations. Although my preference would have been to focus on one main character and to use less poetic language, I’m New Here is a favorite among teachers. It’s considered a touching story about the assimilation of three immigrant students in a supportive school community. Author Anne Sibley O’Brien is American, but grew up in South Korea, and so is familiar with the experience of being a foreigner. She’s one of the founders of I’m Your Neighbor, an organization that promotes children’s literature featuring “new arrival” cultures. You can find a “I’m New Here” Welcoming Kit at I’m Your Neighbor Books. In My Name is Yoon, a Korean girl starts school for the first time in America. To prepare Yoon, her father teaches her how to write her name in English. But Yoon prefers how her name is written in Korean. Her name looks happy in Korean. The letters seem to dance. She doesn’t want to learn the new way. She wants to go back to Korea. Each day at school, Yoon learns a new word in English at school. And each new day, Yoon writes this new word for her name instead of Yoon. Of the five books I’ve reviewed here, My Name is Yoon is my favorite. It tells how a young girl finds her place in a new country in her own time and on her own terms. I laughed and smile … but also understood Yoon’s sadness and frustration, which eventually turns into joy and acceptance. The author, Helen Recorvits, grew up in America. Her grandparents were immigrants from Poland, Russia, and the Ukraine. 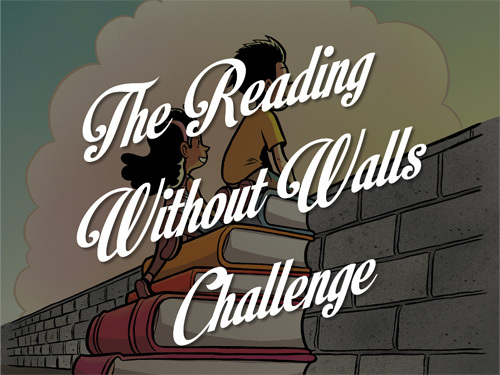 Yang concludes his “Reading Without Walls” challenge by encouraging readers to take a photo of themselves and their books and post to social media. In doing so, he says, readers will inspire others. 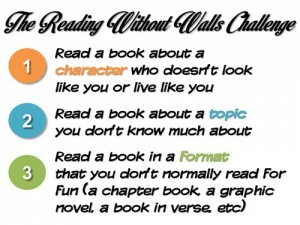 Will you join me over the next year in reading books that take you outside your comfort zone?